Kommandeur Limited Edition Decals was formed in 1996 by Brown Ryle upon his retirement as a Naval Aviator. Brown is the co-author of Squadron/Signal's "FW190 Walk Around" and is presently working on another book dealing with the FW190. 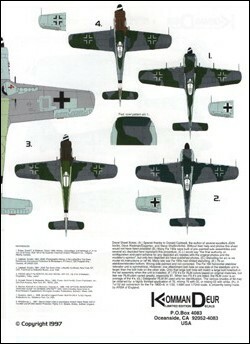 KD produces limited issue decals in runs of 1000 and 500 dealing with WWII aircraft. All KD issues are accompanied by a professionally printed color instruction sheet including profile, upper and lower illustrations for all a/c as well a detailed list of published sources for each a/c's photos. All KD decals are custom printed by Microscale in 1/48th and 1/72nd scale. KD4701FW JG 26 Low Numbers is available in both 1/48 and 1/72 scale. Limited issue of 1000 each scale. US$ 9.00PPD each US and Canada, US $ 10.00PPD foreign. Between 350 and 400 of each available. KD4801FD, KD4802FD and KD4803FD, in the limited 1/48 scale issue of 1000, are sold out. But for the time being Kommandeur Limited Edition Decals still has a very few over-runs left and can, for a limited time, still supply 1/48 scale. Prices subject to availability. KD4801FD, KD4802FD and KD4803FD, in the very limited 1/72 scale issue of 500 is available as a set. Prices subject to availability. Fw190F-8's, one from SG2 and the other from and unknown unit. 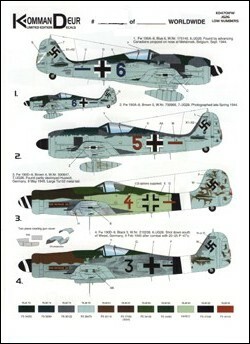 from JG27, two Bf109K-4's, one from NJG11and the other from JG11. JG301, and one BF109G-6 of Major Franz Goetz, JG53. $27.00ppd the three sheet set US/Canada and $28.00ppd Overseas. These decal sheets can be ordered either directly from Kommandeur Limited Edition Decals or at Eagle Editions Ltd.